Kingdom’s Call spans the time from the crucifixion of Jesus to the conversion of Paul. 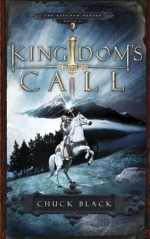 Kingdom’s Call is the forth book in the series and spans the time from the crucifixion of Jesus to the conversion of Paul. The central character Sir Gavin. He embarks on a mission to eliminate the “Followers” of the Stranger from the Kingdom, but the Prince has another plan for him.